Voice is the new big consumer channel of the future, it is growing rapidly but it hasn’t reached the mass yet. Especially in the ‘new’ Google Assistant countries, brands need to teach users how to use the voice assistant. Users are not used to talk to brands via a voice assistant so you really have to guide them. Determine the position of voice within your customer journey at the moment. Try to answer questions on how people can use voice and for what do they want to use voice. 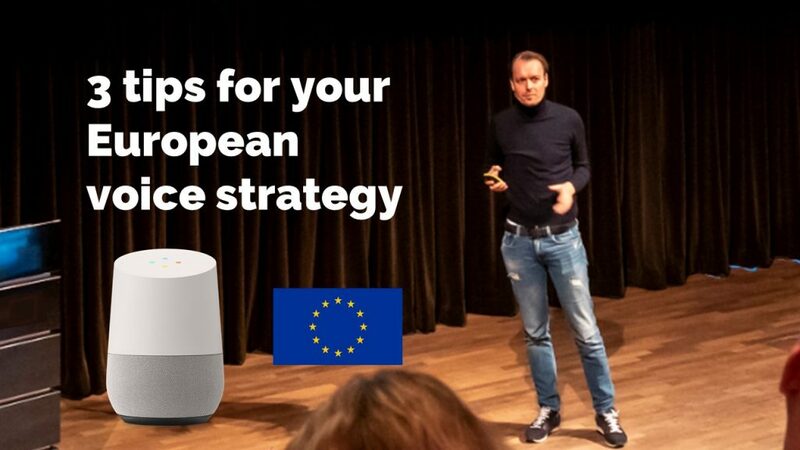 As a brand you currently have to ‘guide’ your voice customers almost in detail, because your customers are not used to a fully voice-controlled UX. What questions does the assistant have to answer and especially which ones shouldn’t it answer. For every country and language you need to review your conversation flows. A voice user can enter thousands of different ways in your Google Action or Alexa Skill. In the conversation that follows you want it to be smooth and natural at all times. So it is necessary to search for the perfect voice UX journey. Important in this is how ‘deep you want to go’: what do you do with further exploration (follow-up questions) etc. Creating reach and increasing visibility of your brand on voice, starts with identifying the user. Every country has obviously a different population, and these populations behave differently and have different needs. So find out who are your potential voice users and what do they need? After you know your potential user you can start optimizing the different voice entry points; search, explicit invocation, implicit invocation, general query, segment specific query, feature specific query. Next it’s time to find out which kind of Google Action will bring the biggest impact. This can be an action that will generate great promotional value or think of a functionality that has great added value for so-called loyal power users.